This article is about a machine that records sales and receipts. For computer hardware and software that does these tasks, see Point of sale. For the software program, see DHPOS. For other uses of "Till", see Till (disambiguation). Historic cash registers in Los Angeles, California: (from left to right) Hedman Company and Paymaster of the 1950s, and Olivetti of the 1980s. An early mechanical cash register was invented by James Ritty and John Birch following the American Civil War. James was the owner of a saloon in Dayton, Ohio, USA, and wanted to stop employees from pilfering his profits. The Ritty Model I was invented in 1879 after seeing a tool that counted the revolutions of the propeller on a steamship. With the help of James' brother John Ritty, they patented it in 1883. It was called Ritty's Incorruptible Cashier and it was invented for the purpose to stop cashiers of pilfering and eliminating employee theft or embezzlement. Shortly after the patent, Ritty became overwhelmed with the responsibilities of running two businesses, so he sold all of his interests in the cash register business to Jacob H. Eckert of Cincinnati, a china and glassware salesman, who formed the National Manufacturing Company. In 1884 Eckert sold the company to John H. Patterson, who renamed the company the National Cash Register Company and improved the cash register by adding a paper roll to record sales transactions, thereby creating the journal for internal bookkeeping purposes, and the receipt for external bookkeeping purposes. The original purpose of the receipt was enhanced fraud protection. The business owner could read the receipts to ensure that cashiers charged customers the correct amount for each transaction and did not embezzle the cash drawer. It also prevents customer from defrauding the business by falsely claiming of receiving a less amount of change or a transaction that never happened in the first place. 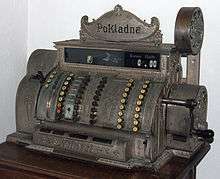 The first evidence of an actual cash register was used in Coalton Ohio at the old mining company. A leading designer, builder, manufacturer, seller and exporter of cash registers in the 1950s until the 1970s was London-based (and later Brighton-based) Gross Cash Registers Ltd., founded by brothers Sam and Henry Gross. Their cash registers were particularly popular around the time of decimalisation in Britain in early 1971, Henry having designed one of the few known models of cash register which could switch currencies from £sd to £p so that retailers could easily change from one to the other on or after Decimal Day. Sweda also had decimal ready registers where the retailer used a special key on decimal day for the conversion. In some jurisdictions the law also requires customers to collect the receipt and keep it at least for a short while after leaving the shop, again to check that the shop records sales, so that it cannot evade sales taxes. Often cash registers are attached to scales, barcode scanners, checkstands, and debit card or credit card terminals. Increasingly, dedicated cash registers are being replaced with general purpose computers with POS software. Cash registers use bitmap characters for printing. Today, point of sale systems scan the barcode (usually EAN or UPC) for each item, retrieve the price from a database, calculate deductions for items on sale (or, in British retail terminology, "special offer", "multibuy" or "buy one, get one free"), calculate the sales tax or VAT, calculate differential rates for preferred customers, actualize inventory, time and date stamp the transaction, record the transaction in detail including each item purchased, record the method of payment, keep totals for each product or type of product sold as well as total sales for specified periods, and do other tasks as well. These POS terminals will often also identify the cashier on the receipt, and carry additional information or offers. 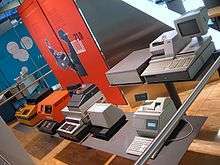 Currently, many cash registers are individual computers. They may be running traditionally in-house software or general purpose software such as DOS. Many of the newer ones have touch screens. They may be connected to computerized point of sale networks using any type of protocol. Such systems may be accessed remotely for the purpose of obtaining records or troubleshooting. Many businesses also use tablet computers as cash registers, utilizing the sale system as downloadable app-software. Cash registers include a key labeled "No Sale", abbreviated "NS" on many modern electronic cash registers. Its function is to open the drawer, printing a receipt stating "No Sale" and recording in the register log that the register was opened. Some cash registers require a numeric password or physical key to be used when attempting to open the till. A cash register's drawer can only be opened by an instruction from the cash register except when using special keys, generally held by the owner and some employees (e.g. manager). This reduces the amount of contact most employees have with cash and other valuables. It also reduces risks of an employee taking money from the drawer without a record and the owner's consent, such as when a customer does not expressly ask for a receipt but still has to be given change (cash is more easily checked against recorded sales than inventory). A cash drawer is usually a compartment underneath a cash register in which the cash from transactions is kept. The drawer typically contains a removable till. The till is usually a plastic or wooden tray divided into compartments used to store each denomination of bank notes and coins separately in order to make counting easier. The removable till allows money to be removed from the sales floor to a more secure location for counting and creating bank deposits. Some modern cash drawers are individual units separate from the rest of the cash register. A cash drawer is usually of strong construction and may be integral with the register or a separate piece that the register sits atop. It slides in and out of its lockable box and is secured by a spring-loaded catch. When a transaction that involves cash is completed, the register sends an electrical impulse to a solenoid to release the catch and open the drawer. Cash drawers that are integral to a stand-alone register often have a manual release catch underneath to open the drawer in the event of a power failure. More advanced cash drawers have eliminated the manual release in favor of a cylinder lock, requiring a key to manually open the drawer. The cylinder lock usually has several positions: locked, unlocked, online (will open if an impulse is given), and release. The release position is an intermittent position with a spring to push the cylinder back to the unlocked position. In the "locked" position, the drawer will remain latched even when an electric impulse is sent to the solenoid. Due to the increasing amount of notes and varieties of notes, many cash drawers have opted to store notes in a vertical side facing position instead of the traditional horizontal upward facing position. This enables faster access to each note and allows more varieties of notes to be stored. Sometimes the cashier will even divide the notes without any physical divider at all. Some cash drawers are also flip top in design, where they flip open instead of sliding out like an ordinary drawer, resembling a cashbox instead. Registers will typically feature a numerical pad, QWERTY or custom keyboard, touch screen interface, or a combination of these input methods for the cashier to enter products and fees by hand and access information necessary to complete the sale. For older registers as well as at restaurants and other establishments that do not sell barcoded items, the manual input may be the only method of interacting with the register. While customization was previously limited to larger chains that could afford to have physical keyboards custom-built for their needs, the customization of register inputs is now more widespread with the use of touch screens that can display a variety of point of sale software. Modern cash registers may be connected to a handheld or stationary barcode reader so that a customer's purchases can be more rapidly scanned than would be possible by keying numbers into the register by hand. The use of scanners should also help prevent errors that result from manually entering the product's barcode or pricing. At grocers, the register's scanner may be combined with a scale for measuring product that is sold by weight. Cashiers are often required to provide a receipt to the customer after a purchase has been made. Registers typically use thermal printers to print receipts, although older dot matrix printers are still in use at some retailers. Alternatively, retailers can forgo issuing paper receipts in some jurisdictions by instead asking the customer for an email to which their receipt can be sent. The receipts of larger retailers tend to include unique barcodes or other information identifying the transaction so that the receipt can be scanned to facilitate returns or other customer services. In stores that use electronic article surveillance, a pad or other surface will be attached to the register that deactivates security devices embedded or attached to the items being purchased. This will prevent a customer's purchase from setting off security alarms at the store's exit. Some corporations and supermarkets have introduced self-checkout machines, where the customer is trusted to scan the barcodes (or manually identify uncoded items like fruit), and place the items into a bagging area. The bag is weighed, and the machine halts the checkout when the weight of something in the bag does not match the weight in the inventory database. 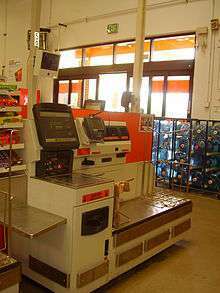 Normally, an employee is watching over several such checkouts to prevent theft or exploitation of the machines' weaknesses (for example, intentional misidentification of expensive produce or dry goods). Payment on these machines is accepted by debit card/credit card, or cash via coin slot and bank note scanner. Store employees are also needed to authorize "age-restricted" purchases, such as alcohol, solvents or knives, which can either be done remotely by the employee observing the self-checkout, or by means of a "store login" which the operator has to enter. 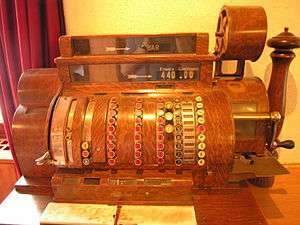 ↑ "Replica of the Ritty Model 1 Cash Register". National Museum of American History. Retrieved April 7, 2009. ↑ "On This Day". The New York Times. January 30, 2002. Retrieved May 18, 2014. ↑ "Inventor of the Week: Archive". Massachusetts Institute of Technology. April 2002. Retrieved April 7, 2009. ↑ Bryson, Bill (1994). Made in America: An Informal History of the English Language in the United States. William Morrow Paperbacks. pp. 114–115. ISBN 978-0380713813. ↑ Brat, Ilan; Zimmerman, Ann (September 2, 2009). "Tale of the Tape: Retailers Take Receipts to Great Lengths". Wall Street Journal. p. A1. Retrieved September 2, 2009. ↑ "Forum relating to the manufacturing activities at the Hollingbury industrial estate, Brighton, during 1960s.". Retrieved July 21, 2009. ↑ "Gross Cash Registers pictures and company history". Retrieved July 21, 2009. ↑ "Restaurants, paying the bill, receipt, check". Slow Travel Italy. Retrieved September 27, 2013. ↑ "When in Italy, Keep That Receipt!". Roderickconwaymorris.com. April 10, 1992. Retrieved September 27, 2013. ↑ "Type: Bitmap". Papress.com. Archived from the original on March 20, 2014. Retrieved September 27, 2013. ↑ Wingfield, Nick (April 22, 2013). "Tablets transforming the cash register". The New York Times. ↑ "Cash Drawers". PCS Technology Ltd. Retrieved April 30, 2012. ↑ "IBM Self Checkout Systems". IBM. Wikimedia Commons has media related to Cash registers.